To enter expert levels in Astro Barrier, wait 30 seconds between level 30 and 31 and shoot the blue ship that appears. Astro Barrier Cheats: On level 7, when the screen tells you about the blue bars/enemies, click the one in the example for a free life. On level 10 or 30, if you wait a minute, a blue ship will appear, and if you shoot it, you’ll go to the expert levels. To catch the Big Fish in Ice Fishing, use a little fish as bait! At the menu of AstroBarrier (the screen you get to after you press the Start Button), press 1, 2, or 3, to get to level 10, 20, or 30! Puffle with no name: Buy a puffle at the store, when you’re asked to write a name, just push the spacebar a few times, then click Next. Low definition Club Penguin: This is good if you’re in a laggy server. Press the += button next to the Backspace button to go to Low-def CP mode. You won’t lag anymore! Sitting Forward: Press a spot to walk to (You can face anyway you want [forward, sideways, backwards]). Press s.
I don’t believe this is really a cheat but your puffle dances along with you when you dance (That is assuming you are taking it out for a walk). Hidden buddies: If any of your buddies are logged in in a different server than you and you log in, check the buddy chat quickly after you log into any server (other than the one your buddy is on) and your buddy list will say they are on (even though its only suppose to say that if they’re on the same server as you [By server I mean like ‘Tundra’ or ‘Mammoth’]). You will only see this for one to two seconds. To put wall items flipped sideways, have a wall item up on the wall and quickly drag it outside the igloo, and it should be sideways. WEIRD DANCE WITH DIFFERENT CLOTHES ON: Have on any clothes (something cool), open your player card, take off everything and put on an item that makes you do a special dance or wave (like Maracas or a tour guide hat). With the player card still open, do the dance/wave, and you should be dancing with the other clothes on! Once, I had been throwing snowballs prior to this and each time I waved with the tour guide hat on, my penguin with the clothes on would throw a snowball and hold the sign up at same time. To make furniture items go on the wall and vice versa, double click the furniture item on the top rows of your inventory. You can do the same with wall items. WALK ON LIGHTHOUSE WALLS: Go to the lighthouse, go behind the barrel of fish (or somewhere between the barrel and boat), click the door a few times and then click above the door, and you’ll walk on the walls. DANCE AND TALK WITH THE PAPER: Update: (Doesn’t work anymore. I’m keeping it up here because this was an awesome glitch. ~Watex) Unfortunately, this cheat does not work anymore. However, you can still spy on friends when you’re reading the newspaper and type into the chat box. Walk to the bottom of the screen so you’re above the chat box in Club Penguin. Open the newspaper and start to send a joke or riddle. When it asks what you want to send, press tab until you can type into the chat box. If penguins next to you talk to you, you can see what they say. EDIT IGLOOS: Update: (Doesn’t work anymore. I’m keeping it up here because this was an awesome glitch. ~Watex) Method #1: Open your buddy list, then open the ‘Edit Igloo’ button in your igloo, then click on your buddy list and go to one of YOUR BUDDY’S igloos. You can now edit their igloo! And now you can also go to other penguins igloos to edit their’s even if they’re not your buddy! Method #2: Go to your igloo, click the ‘Edit Igloo’ button. Now click on your penguin to show your player card. Click on your Secret Agent Spyphone and Teleport to the HQ. Then go to any igloo and you can edit it. However, other people won’t see you edit their igloo. WALK WITH PAPER: USE THIS LINK ONLY OR IT WONT WORK: (Doesn’t work anymore. I’m keeping it up here because this was an awesome glitch. ~Watex) http://play.clubpenguin.com/load.swf . Click on someone’s player card and drag it outside. Go play Find four or Mancala. When the sign pops up, click it rapidly/quickly (try to press it twice but once will work). Click on the newspaper now, (with the game still up and the player card still up). Then click on the ’send card’ button (Don’t X out of the game or newspaper) and send that person a card. Now you’ve exited out of the newspaper/player card automatically. Now go to the town center or the ski village, then go back to the room you were playing in and everyone will see you walking with a paper and call you a lucky hacker along with the screams of jealousy. Note: you can’t see this yourself. WALK ON LIGHTHOUSE WALLS: Walk onto the box of fish (so the cart is blocking you and you can only see your name). Now click on the exit door (left of the thing with an 8 on it) and then IMMEDIATELY click on something on the upper left, like the picture of a penguin, AS FAST AS YOU CAN AS MANY TIMES AS YOU CAN. You will walk on the wall. FLASHING WORDS: Say “green commander of (you can say anything here)” and the words will flash (excluding the parenthesis, what I said inside the parenthesis, and the apostrophes (these things: “). For example, green commander of Fever will flash if you say it. It works best if the word you use is 3-5 letters long. Tips on locating Rockhopper: Rockhopper finding guide here: http://watex.wordpress.com/2007/06/22/rockhopper-finding-guide/ Rockhopper can be anywhere (even sledding at the mountain top) but he is usually on his ship (at the shore next to the lighthouse). And if you’re server surfing for him, just look for a server that has more people than it used to (like double the usual amount). That’s probably where he is. If you can beat ‘Jet Pack Adventure’ without getting a single coin, you will get 1,000 coins at the end as your reward. MORE FLASHING WORDS: Say “Green commander of cheese” without the quotes and move around and it will flash! CLOTHING/FURNITURE CATALOG SECRETS: Look on my main site! I post the current ones all the time! Current stuff will be posted on: http://watex.wordpress.com/ If they don’t work, I probably posted the most current one on my homepage: http://watex.wordpress.com . New Walk on Club Penguin Pathways: A pathway is somewhere where when you usually go, it’ll take you to another place on the map, such as the right/left pathways next to the Town. However, with this cheat, you won’t be taken to another map. First, click on the part of the pathway you want to go to. Now while you’re still walking, click the Penguin Mail envelope at the top left. Stay in the P-Mail thing, viewing your postcards/mail, until you think you have stopped walking. Then exit P-Mail and you are standing on a pathway! Now you can dance, talk, whatever! Big Rainbow Bracelet of Doom: Go to the Book Room (above the Coffee Shop) and sit on the big chair on the far left. Then click on the stairs to exit the room. As soon as you click on the stairs, immediately open the Library (click lower right hand corner) and open the book ‘Rockhopper and the Stowaway’ and flip to the last page of the book to where the free Rainbow Bracelet is. Then click the bracelet but DON’T click Yes or No. If you do all this before your penguins gets to the stairs and exits the room, the cheat should work. When the Coffee Shop loads, there should now be a big Rainbow Bracelet floating in the air. The bracelet will stay with you no matter what place you go to on CP until you log off. If you want to get rid of the bracelet before logging off, you can redo the cheat but this time, click Yes or No. To use Watex’s Toolbar, go here; you can search on Google, go directly to many important places on my website, you can go to Club Penguin, and know IMMEDIATELY when I post something new. Teleport Cheat: [Doesn’t work anymore] Go to a highly populated server in Club Penguin that’s almost always full. Go to a place in CP thats full as well, like the Dock. There has to be a LOT of people here for this to work, and your comp should be lagging at least a little. Do the fart emote (Press E and then T) and a Music Emote should appear over you. Now walk around the Dock and you should be walking incredibly fast for the first three to four seconds. It will look to others like you’re teleporting. Play two Mancala games at the same time: Go to the Mancala room (above the Coffee Shop). Go to a Mancala game and click Yes real fast many times when it asks if you want to play. Then walk downstairs. Now go back upstairs and go to another Mancala game and play it. If the person playing the first game quits, you will know! Room is full: Go to the Mancala or Find Four room (above the Coffee Shop or Lodge). Go to a Mancala/FF game and click Yes real fast many times when it asks if you want to play. Then walk downstairs. Walk back upstairs and go to that same game. When you try Watching the game, it’ll say the Room is full and the room you’re in will reload! Permanent Sliding Words: Say this in regular Club Penguin (without the quotation marks): “Want to help make movie? You be famous!“ but without the quotation marks and then walk around. The words will slide once and stop. Puffle Bounce Cheat: Go to the Puffle Shop. Point your cursor at the Puffle Pen, the puffles will start bouncing. Click and drag your cursor from the pen to the Puffle Shop door. If you do it right, the puffles will still be bouncing where ever you go. The Flying Rainbow Hat Cheat: Take off everything and put on the Umbrella Hat. Open your playercard and take off the hat and put on your Tour Guide hat, but don’t close the playercard! Now wave. Your gigantic rainbow hat should fly off onto the ground and fly all the way back to your head. Make a Puffle Cry: Do the Puffle Emote (Press E, and then P) and then press the += button next to Backspace. Your puffle will now be crying. Walk under the chatbar: Go to a room where you can walk on the right and left of the chatbar. I suggest the Dojo. Go to the far right or far left of the Chatbar (so you’re exactly right/left of it) and as far down as possible. Then click the other side. (For example, if you’re on the left side, you should click the right side). You should walk right through the chatbox and only your hat will show. This is REALLY fun if you’re saying something as well. This also works well in many other rooms like the Lighthouse. Watch what others say when reading the newspaper: Go to a very big place on the map. Open your newspaper. Send a Joke/Riddle/Ask Aunt Arctic. Now stay on the place you are at before you send it. This is where you can see others do stuff while you read! Big Message Of Doom: This will look a little different from the other “Big ____ Of Doom’s”. Go to the gift shop. Start walking towards the Changing Rooms. Click on another penguin’s playercard request to be his/her buddy before you get there. Now the screen should say “Request Sent”. And you should have walked up to the Changing Rooms. When you walk up to the Changing Room, an automatic Catalog should have appeared. Now click OK to the “Request Sent” Display. The catalog will now close, but the message will still be there! No matter how many times you click OK, the message will still be there. Until you log off! Bell on ground, Sign up high: Take off everything but the tour guide hat and the bell. Now, if you wave, you should ring your bell. Open your playercard. Take off your bell, but keep the playercard open. Now wave. Your bell will be on the floor and you will be holding your tour guide sign up. Hold up your hands with a bell: Wear nothing but a bell. Open your playercard. Take off the bell and put on your tourguide hat. With your playercard still open, wave. You should have your hands up in the air and the bell on the ground. Others won’t see this. Cool Cove Nubbing: This is a very cool cheat. Go on CP normal screen mode. Go to the Cove. Click on the white float/bumper connected to a string of other floats/bumpers at the bottom right corner of the screen, so your penguin walks there. Now click LEFT of the chatbar and RIGHT of the Map. Your penguin should start walking left, through the chatbar and stop in the middle of it. Now you can talk and dance and many other things and other penguins will see it! This cheat can also work in other places in CP, such as the Mine Shack. Tour Guide, Maraca Cheat: Wear nothing but the Tour guide hat and Maracas. Open your player card and take off the Maracas. Without closing your player card, dance. There should be a Tour guide sign floating in the air. Your tour guide hat will float in the air while you move around shaking invisible Maracas! ULTIMATE TALK/DANCE/WHATEVER WITH NEWSPAPER CHEAT in Chat server: [Unfortunately, this does not work thanks to the new CP Update. I will keep it for others to view though] Go to a server. Click the ? button on the toolbar. Tick Ultimate Safe chat. Go to a new room. Tab until the yellow box is around the ‘?’ button on the far right of the blue toolbar at the bottom of the screen. Press enter. Now close the screen that pops up. Your penguin will have the newspaper open but you will have the newspaper closed and now you can talk, dance, whatever! Secret Hidden Pins to view in Yearbook 2005-2006: Go here to find out the secret places to click to view the pins that were released for each month of the Yearbook. ‘Burnt out Bulbs’ Hidden Coins Guide: Click here to view the hidden places to find the Bonus coins in the ‘Burn out Bulbs’ game. Finding all the coins give you 800 coins total rather than 220 without finding the bonus coins. -Dock: Click the handle of the pump to make the penguin pump some more and bounce the other penguin into the air. The coin is underneath him. 3. The areas are different depending on your choice, but the idea is the same; drag whatever heavy, clickable object is nearby, and look for a coin to bounce out of the background when the first object drops. 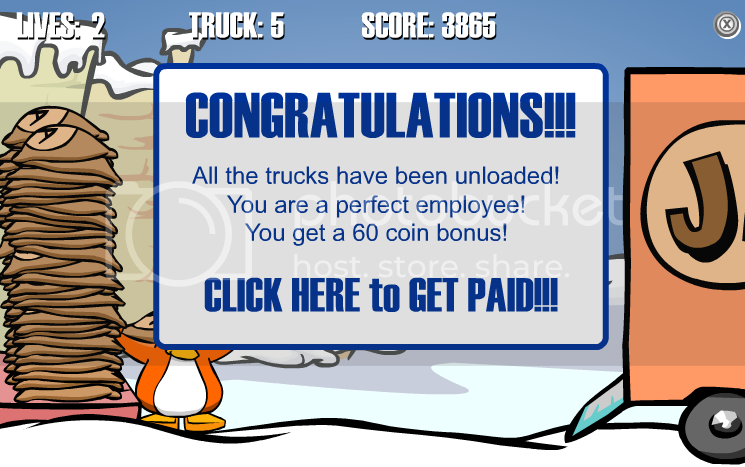 You might want to do this before typing in ‘penguins’ because they can make it hard to see the coin/object. 4-5. These two pages are the same. Drag the background down and a coin will come down too. Click the coin before the background springs back into place. It seemed to me that the coin moved away from my cursor, which made it very difficult. If you complete the book and get every coin, you get a 100 coin bonus, making the total 250 coins. Not bad, but compared to the 800 coins in “Burned Out Bulbs” this isn’t worth your time if you’re looking for fast coins. Aqua Grabber Cheat: Tap the left, right, up, or down arrows repeatedly and very fast and you’ll move just as fast as holding down that button but without losing as much oxygen! Speed Everyone in the Room Up: This works best when it’s a really crowded room, like if Rockhopper’s in the room or there’s a party because the place has a lot of active users who move around a lot. When Rockhopper just started moving and the huge crowd around him moves after him, do the fart emote (Press E and then T). Everyone moving will speed up and so will you. They will all be able to see this. Others can do this to you too. This works best when its laggy. Players in the Room: Open your buddy list, and click the button between the Smiley face and the Skull face. The button will open up a list on all the players in the room. You can click their names to see their playercards. Quick Re-Log in Tries: Use Miniclip’s CP to Log off and log into Club Penguin without having to go back to the home page each time. This way, it’ll triple your tries at getting into a full server. Read Newspaper without logging in: Go here: http://media1.clubpenguin.com/play/v2/content/local/en/news/20080724.swf but replace the numbers at the very end with the year, month, then date. If the month/date is a one digit number, be sure to type a zero in front. Full Aqua Grabber Guide: To read the full guide, go here. Find Four Glitch: When playing Find Four, CP made it so that it doesn’t highlight the four pieces in a row when you win anymore. It just closes the game once you win. So if you or your opponent doesn’t look carefully right before the winning move, then you can say you won even if you didn’t! Club Penguin Comics: To read all the Club Penguin comics, go here. Take off all penguin clothes with one button: First, you have to have at least one penguin ticked as Remember Me On This Computer. Then, go back to play.clubpenguin.com to play. But DON’T log in yet. Just click Start. Now a picture of your penguin will appear. Press and hold the “Enter” or “Return” key on your keyboard. All your penguin’s clothing will disappear! If it doesn’t work try refreshing, then repeating. 45 Responses to "Cheats and Glitches Here!" HOW DID YOU GET THIS PAGE BACK??? Watex: Wow nice first comment. I was browsing the internet. i just went to the funny pics page then 1 second later this page appeared lol! Nice page! I found this on the internet too! WAY too many people copy all your cheats and glitches and act like they are theirs… Could you maybe add me to your blogroll… please? I added you to mine! Heyy watex. what is wrong with cp? mine isn’t loading.. like ever! Watex: It is a glitch. Or many people are going on the servers that Club Penguin is really busy. What happened to your other site? How did you get your first website suspended? You had way more cheats on that one then this one! Awesome, but where is the coin cheat??? Hi, I’m a big fan of your blog. Thanks for the Low def cheat, It really helped. can you upload videos for the cheats cuz I dont get some of the cheats? Hello Watex i found a cheat that if u have 7 security camras and u move your mouse really fast from side to side and u stop on the left side the camaras on the right side r still pointing to the middle. Are you going to make an xat.com chat? Hey watex i got 2 cheats! How to login with more than 1 account. 1. Make sure there are no penguins that have the remember me thing. 2. Login with any penguin. 3. When it says multiple connections detected click disney its not a link or anything its just part of the glitch. 4. After you click it hit enter on your keyboard. 5. When it comes up to the screen when you have to put your name and password hit enter again without typing anything. 6. It should say You must enter your penguin name and click ok.
and then u can sign in! 4. Do not put in anything just click send and then go back to the front page. 5. Hit tab at the front page and now you can type in stuff!! If you look in the newspaper ( doesn’t matter which one.) And you go to the page where Aunt Artic responds to her questions. Then you scroll over Aunt Artic and her glasses turn to black shades. Watex nubbing still works only in the cove. 2. Click the white thing. 3. Click right of the map. This doesn’t need to go to a swf website. You DO know that the links that have your old website on them DONT work anymore? I tried to go to your ‘Rockhopper Finding Guide’ glitch but it said on the link that your website was suspended. Which I know is true…But the links dont work! So post it on THIS website! fultbulista’s cheat isn’t hers. i know what site its from dont post hers. WATEX!I FORGOT THE USERNAME OF THE PENG U GAVE ME!!!!!!!!!!!!!!!!!!!!!! !PLS TELL IT TO ME AGAIN!!!!!!!!!!!!!!!!!!!!!!!!!!!!!!!!!!!!!!!!!!!!!!!!!! !PLS !PLS! hey watex, u mind if i use these cheats? ill give u fulll credit n u can go on my advertisement page! dont put my other comment with the secret page out plz, its a secret! hehe…hope u like it, im still updating it, its on penguingrl.wordpress.com so go on pages on the right n click the Secret Page then type da pass in! Watex: You make a WordPress. WP always tells Google every time a new blog is released. are you really an army?